In his classic 1936 comedy Modern Times, silent filmmaker Charlie Chaplin depicts the trials and tribulations of a harried factory worker trying to cope with the sprockets, cogs, conveyor belts and “efficiencies” of the new industrial culture. The poor fellow finds himself caught up (almost literally) in the grinding tyranny of the machine. The movie is hilarious, but it’s also a damning portrayal of the dehumanizing consequences of mass industrialization. 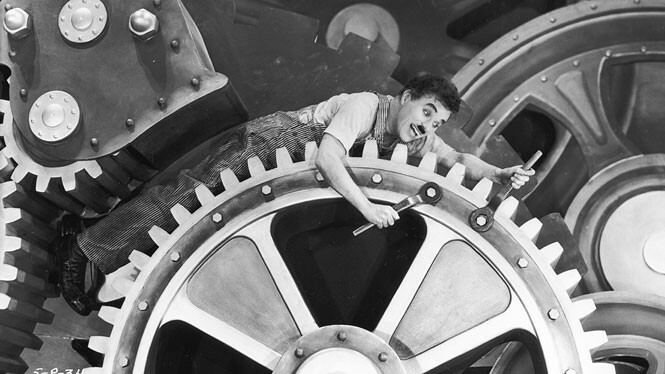 The ultimate indignity for Chaplin’s everyman character comes when he is put on an assembly line that includes a mechanized contraption that force-feeds workers as they work. Not only does this “innovation” eliminate the need for the factory owner to provide a lunch break, but it also transforms human workers into automatous components of the machine itself. Charlie Chaplin in Modern Times: The poor fellow finds himself caught up (almost literally) in the grinding tyranny of the machine. The movie is hilarious, but it’s also a damning portrayal of the dehumanizing consequences of mass industrialization. Of course, worker-feeding machines were a comedic exaggeration by the filmmaker, not anything that actually existed, nothing that would even be considered in our modern times, right? Well ... not so fast. If you work for Amazon.com, you might swear that Chaplin’s masterpiece depicts Amazon CEO Jeff Bezos’ idea of a properly run workplace. But why pick on Amazon, a company that has built a positive reputation with millions of consumers? After all, isn’t it a model of tech wizardry, having totally reinvented retail marketing for our smartphone, globally linked age? Doesn’t it peddle a cornucopia of goods through a convenient “one-click” ordering system, rapidly delivering them right to your doorstep? 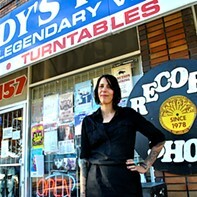 And doesn’t it offer steep discounts on nearly everything it sells (which is nearly everything)? Yes, yes and yes. However, as an old saying puts it: The higher the monkey climbs, the more you see of its ugly side. Amazon certainly has climbed high in a hurry. Not yet 20 years old, it is already a household brand name and America’s 10th largest retailer. Yet, mesmerized by its digital charm and explosive growth in sales, few have looked closely at the Amazon animal. Its media coverage has been more gee-whiz than questioning. The press marvels at Bezos’ obsession with electronic streamlining and systems management that allow Amazon to sell everything from books to bicycles, barbecues to Barbies, at cheap-cheap-cheap prices, undercutting all competitors—even Walmart. But what is the source of those efficiencies and the low prices so greatly admired by Wall Street and so gratefully accepted by customers? Are they achieved strictly by being a virtual store, saving the costs of building, staffing and maintaining brick & mortar outlets? Or is Amazon achieving market dominance the old-fashioned way—by squeezing the life out of its workers and suppliers, by crushing its competitors with monopolistic muscle, and by manipulating our national and state tax laws? Voila! There’s the ugly side. Amazon and Bezos need more scrutiny because Amazon, more than any other single entity, has had the infinite hubris to envision a brave new computer-driven order for our society. Bezos isn’t merely remaking commerce with his algorithms, metrics and vast network; he’s rebooting America itself, including our concept of a job, the definition of community, and even basic values of fairness and justice. It amounts to a breathtaking aspiration to transform our culture’s democratic paradigm into a corporate imperium led by Amazon. Walmart is now yesterday’s model of how far-reaching and destructive corporate power can be. Amazon is the new model—not just of tomorrow’s corporate beast, but the day after tomorrow’s. Only it’s already here. Legend has it that the founding of Amazon is a classic story of a guy pulling himself up by his own bootstraps. In 1994, a bright young fellow named Bezos heads off to the Seattle suburb of Bellevue, with not much going for him but old-fashioned pluck and a unique idea: Selling books on this new thing called the Internet. Some called him crazy, but the bold entrepreneur got his online “bookstore” started in his garage in 1995. And lo, 19 years later, it has sales of nearly $100 billion a year and has made Bezos the 13th-richest American. In reality, Amazon did open for business in a Seattle garage, but guess where it was conceived? Wall Street! For the eight years between graduating from Princeton and landing in Bellevue, Bezos was a well-paid Wall Street investment banker. In 1994, while working at D.E. Shaw, a powerhouse hedge fund, he came across a report showing that Internet marketing was about to boom, expected to grow by 2,300 percent a year. That’s when—click!—the Amazon light bulb lit up in his head. By the way, Amazon’s now-iconic brand name was not Bezos’ first choice. It was initially incorporated as “Cadabra,” as in abracadabra. But that sounded too much like “cadaver.” Then came a suggestion he really, really connected with: “Relentless.” How perfect that would’ve been! But wiser heads prevailed. So, Bezos finally settled on Amazon, noting with typical modesty that the mighty Amazon River is the largest, most powerful river in the world—literally a force of nature. Amazon is by far the largest online marketer in the world, with more sales than the next nine U.S. online retailers combined. That has given Bezos the monopoly power to stalk, weaken and even kill off retail competitors—threatening such giants as Barnes & Noble and Walmart and draining the lifeblood from hundreds of small Main Street shops. Lest you think that “predator” is too harsh a term, consider the metaphor that Bezos himself chose when explaining how to get small book publishers to cough up deep discounts as the price of getting their titles listed on the Amazon website. As related by Businessweek reporter Brad Stone, Bezos instructed his negotiators to stalk them “the way a cheetah would pursue a sickly gazelle.” Bezos’ PR machine tried to claim that this comment was just a little “Jeff joke,” but they couldn’t laugh it off, for a unit dubbed the “Gazelle Project” had actually been set up inside Amazon. Brad Stone’s book gives a chilling example of one such predation. Amazon has its own corporate espionage team called Competitive Intelligence that tracks rivals. This top-level team focused on doing exactly what Bezos’ metaphor instructed: Pursue vulnerable small publishers and squeeze their wholesale prices to Amazon down to the point of no profit, thus allowing the online retailer to underprice every other book peddler. 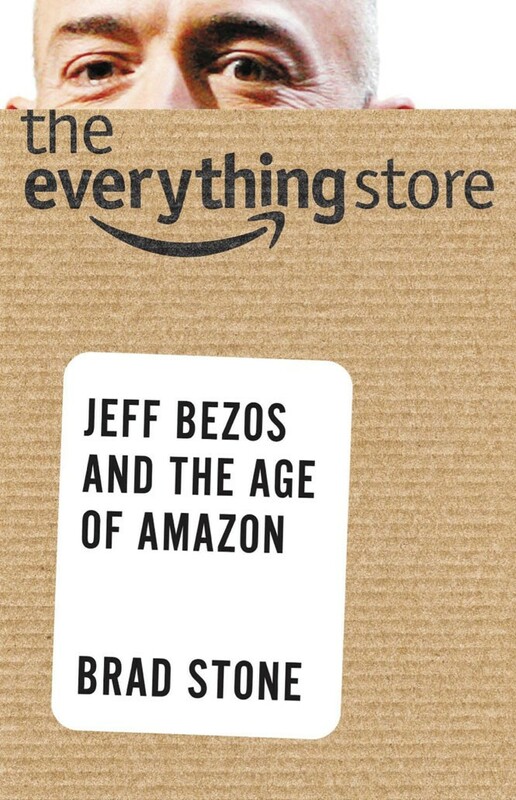 When Stone exposed Gazelle in his 2013 book The Everything Store, the project was rebranded with a bloodless name—“Small Publisher Negotiation Program”—but its mission remains the same. Today, Amazon sells a stunning 40 percent of all new books, up from 12 percent five years ago. It is even more dominant in the digital book market, which is fast catching up to the sales level of physical books and is widely perceived as the future of publishing. Electronic book sales were nonexistent just seven years ago; today, about a third of all books sold are e-books, and Amazon sells two-thirds of those. Of course, Amazon also owns Kindle, the largest-selling device for reading digital books. With his market clout, deep-pocket financing and ferocious price-cutting, Bezos has forced hundreds of independent bookstores to close and has humbled the superstore book chains that once preyed on the independents and dominated the market. Borders, the second-largest chain, succumbed to bankruptcy in 2011. Now Barnes & Noble, the largest brick & mortar bookstore, is stumbling. It has lost millions of dollars, closed dozens of stores, shrunk most others, and suffered the embarrassment of its own board chairman frantically dumping big chunks of Barnes & Noble stock. Bezos’ online empire not only stands alone as the paramount bookseller, but is also the dominant price-setter, the arbiter of which titles get the best access (or none) to the biggest number of buyers, the most powerful reviewer of books, the publisher of its own line of books, the keeper of an in-house stable of writers—and even the sponsor of a major book prize. He achieved this the old-fashioned way: brute force. While it’s true that Amazon is innovative, efficient and focused on customer satisfaction, such factors alone did not elevate Amazon to its commanding level of market control. To reach that pinnacle, Bezos followed the path mapped by Rockefeller and other 19th-century robber barons: 1. ruthlessly exploit a vast and vulnerable low-wage workforce; 2. extract billions of dollars in government subsidies; and 3. wield every anti-competitive weapon you can find or invent to get what you want from other businesses. Through doing all of the above, Bezos has applied his cheetah business model to nearly everything retail. Amazon’s massive book dominion is now dwarfed by its annexation of dozens of other markets—book sales now make up a mere 7 percent of Amazon’s total business. Amazon has already captured more than a third of all online sales with a website that’s a phantasmagoric mall of unimaginable size, containing what amounts to hundreds of virtual superstores. In the process, and with the same deeply discounted prices they used to conquer the book business, Amazon has poached millions of customers from neighborhood shops and suburban malls. The chase for cheap has been great for Amazon, but it is proving intolerably expensive for your and my hometowns. Our local businesses lose customers and have to close, local workers lose jobs, and local economies lose millions of consumer dollars that Amazon siphons into its faraway coffers. What makes that even more intolerable is that much of Amazon’s competitive advantage has been ill-gotten, obtained by dirty deeds.